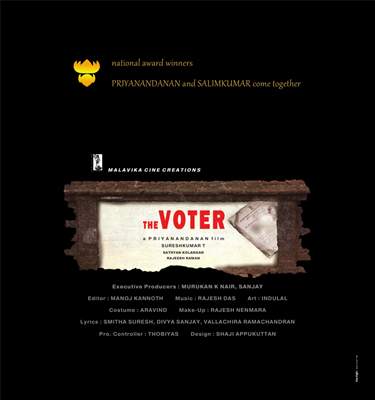 The Voter malayalam movie directed by Priyanandanan will feature Salim Kumar in lead. With the pre production works of the movie currently progressing, it is the makers are expecting to reach the movie at the international level. The movie is produced by Suresh Kumar under Malavika Productions. The movie starts rolling from the end of July. When two national award winners join for the project, it would add more curiosity to the readers. Two times National award winner Director Priyanandanan and National award winner for Best Actor Salim Kumar are gearing up to work together for a movie which do have ample scope to reach at the international level. Titled 'The Voter', the pre production works are currently progressing while the shooting is expected to start rolling from the end of July. Taking to SpiderKerala, Suresh Kumar, the producer confirmed about the project. "Yes, I am currently busy with the pre production works of my second venture 'The Voters' which has a unique plot. As the title suggest, it is the story of election conducted in a place called Thanthonnithuruthu. This small island lacks the basic facilities including water and electricity. The movie welcomes the audience to watch the proceeding connected with Election Day. The polling station situated in Thanthonnithuruthu is having only one voter. The story of the movie is connected with activities held from morning till evening on an election day." says Suresh. "The viewers would get an opportunity to witness yet another real time acting experience of Salim Kumar who had shouldered 'Adaminte Makan Abu' to international fame. Known for his excellent performance on camera, Salim Kumar would be getting a rare opportunity to give his best on screen." Suresh gets excited. Priyanandanan was the captain of the movie 'Pulijanmam' which won the National Film Award for best feature film in 2007. Known for his excellent work behind the camera, Priyanandanan who started his career as actor in stage shows had directed four movies. Neythukaran, Pulijanmam, Sufi Paranja Katha and Bhakthajanangalude Sradhakku are good examples of the craftwork of Priyanandan. The movie produced by Suresh Kumar under the banner Malavika Productions will start rolling by the end of July.